It’s never too early to teach kids how to curate contemporary art exhibitions. Good News Only, a new organization on the North Side, is dedicated to teaching high-school students the skills of becoming a curator. This includes exposure to Chicago’s cultural events, selecting an exhibition theme and artworks, visiting artists’ studios, installing the gallery, writing educational materials about the show, maintaining the gallery, learning the business of keeping the gallery running, and attracting an audience to the show. The gallery’s founder, Elizabeth Shank, is hopeful that these skills will translate into real-world skills for the kids. Her after-school program intends to bolster the confidence of its youth participants to visit and engage the cultural offerings of the city. Shank, the block-club president of her street in the Edgewater neighborhood, began volunteering at Senn High School as a tutor and mentor. Following the school’s first successful year of its new fine arts curriculum, she applied to run an After School Matters program at Senn, which was waitlisted, but Shank was eager to get her curator’s school running. She founded Good News Only as a storefront on busy Ridge Avenue. The space is clean and bright. Its first exhibition is a small selection of photographs from the gallery that Shank used to work at in New York City, as an example of what will be possible for the kids to organize. Shank was inspired to open Good News Only in Edgewater, and in association with Senn, because of its diverse constituency. She works closely with the local Pan-African Association to mentor refugee families. A recent field trip to the MCA was an opportunity for the children to visit Michigan Avenue and a museum for the first time. Some neighbors in Edgewater misperceive the Senn High School students as troublesome and violent, sometimes confusing them with drug sales and shootings near the Thorndale Red Line station. A neighborhood task force and “positive loitering” events were established by neighbors in order to edge out criminal activities. Shank wanted to add to that chorus of good work, and to reveal that Senn students are interested in contributing to the Edgewater community. In addition to recruiting kids for the curatorial projects, Shank is working on getting an upcoming public art project off the ground. Called “Before I die…,” it will take up a large exterior wall in the neighborhood and replace it with a chalkboard, inviting strangers to fill in the blank. The local alderman’s office was partially supportive of the effort, although some expressed concerns about the word “die” given the recent gun-related crimes. The interactive “Before I die…” project was invented by artist Candy Chang, and has been successfully presented in locales around the globe. Shank does not wish its inclusion in Chicago to be controversial, but wants to be positive about art, culture and community involvement every step of the way. 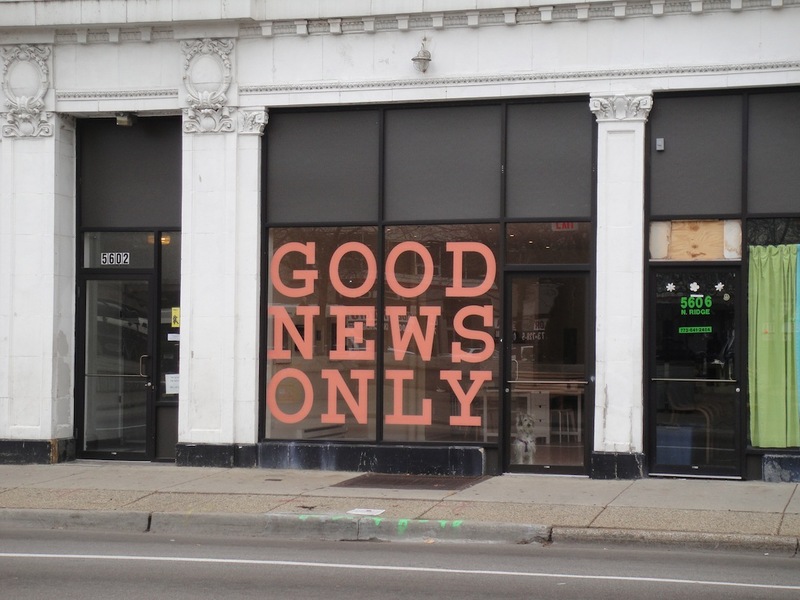 Following the opening of the Good News Only storefront, and with the support of a board of trustees, who are all based in New York City, Shank is working to finalize her nonprofit status and to increase enrollment in the curator’s school. Good News Only is part of a changing tide in micro-local, neighborhood art movements. In Edgewater, GNO joins Tricia van Eck’s new 6018 North, which recently hosted “The Happiness Project,” as well as Edgewater Artists in Motion, which places art in vacant storefronts. Shank is interested in “using art for social change,” and hopes that the public will be on board with her vision.